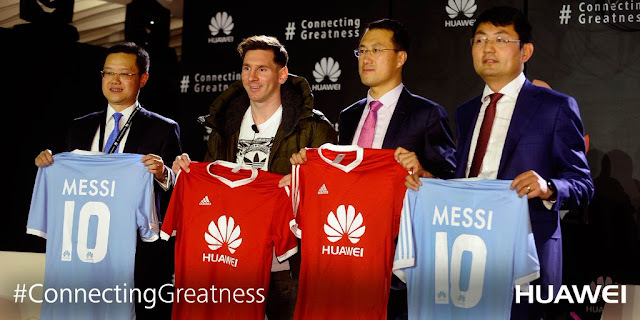 Huawei, global leading company in ICT and telecommunication solutions, announces Lionel Messi’s appointment as the latest Global Brand Ambassador to the company. The partnership with Lionel Messi showcases the brand’s alignment with people and brands that demonstrate, and strive towards its shared value of connecting greatness. Challenges test our desire to achieve what we want and love. To connect with greatness, we have to value the growth, learning, experiences and struggles as the parts of our story that took us where we are now. Those who understand that are always pursuing not success but challenges, to be better. That is what makes Huawei and Lionel Messi a perfect fit. “Lionel Messi will help our brand to encourage people to focus, persevere and breakthrough; to connect with greatness, especially in Europe, Asia, and Latin America, where Huawei puts great devotions. We both honor the path we walked to what we have achieved, and with each new challenge we renew our commitment to find the path to success.” said, Kevin Ho, President, Handset Business, Huawei Consumer BG. By connecting greatness, we demonstrate our passion to our customers. This concept also mirrors Lionel’s life and career. Lionel and his family did everything they could, including leaving their home country, to connect Lionel’s life with his aspirations and dreams of playing professional football. “We are happy to announce our collaboration with an extraordinary individual who inspires people all over the world to pursue their dreams, to face challenges to become better with each day. A man who shares a lot of the same values with the Huawei brand and who is always looking for opportunities to reach greatness.” said Tyrone Liu, CEO Consumer Business Group for Huawei Latin America. Huawei believes that sports are a great way in which people enrich their lives and that is why our commitment towards sports in general, and football in particular, is so strong. In the last few years, we have invested in several teams – like the América, Santa Fe, Sporting Cristal, Arsenal, Atlético de Madrid and the AC Milan – that inspire people all over the world and in players who we believe share our brand values such as Robert Lewandowski and Alexis Sánchez, and now Lionel Messi. Driven by its obsession to innovation and commitment to excellence, Huawei has now become the top 3 smartphone manufactures around the world. The superior performance and outstanding design of flagship models from Mate, P and G series have become one of the popular premium mobile decides among the high-end consumers worldwide. The Mate 8 is designed for smart business professionals who are after a new style. Since its official launch on 26th November 2015, Huawei has shipped around 3 million Mate 8 smartphones to consumers all over the world. I wish this association All the very Best and I hope to meet Lionel Messi if he ever comes to South Africa during the launch of the latest Huawei Smartphone.